L. saccatum is extremely rare and most difficult as a garden subject. Title photo was provided by Alan Mitchell of Scotland of a subject he located in the wild while on lily safari. 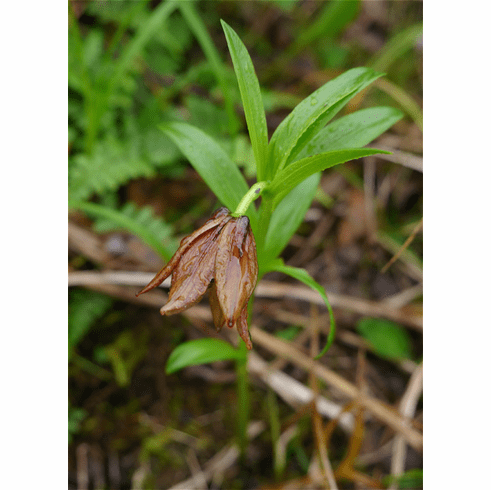 A high elevation lily found from about 8,000 to 12,000 feet (2,700 to 3,400 meters), it likes a moist spot that is rich in humus. Stems in nature range from about 6 inches to 18 inches (15 to 45 cms) When first discovered in 1924 in then Burma, it was classified as being Nomocharis and was transferred to being a "lily" in 1950 as recorded in 'Lilies' by Patrick M. Synge. In his book, 'The Lily Species and their bulbs', Pontus Wallsten writes that Alan was not particularly taken by this lily and reported that the flower appeared as a "used tea bag placed on a short lily stem". Photo inset also shows L. saccatum in its nature habitat. Coyprighted Yijia Wang, all rights reserved. Used with permission. Yijia Wang offers seed of several Chinese Alpine Lilies at his nursery found at www.canursery.com along with some rare and magnificent alpine natives of China.